Do you use Influence Marketing to network with your industry persuaders? Whether you are a big brand or a small business, Influence Marketing is a flourishing method to build your online social standing, increase your SEO, and drive traffic to your blog. In part one of this three part series on Influence Marketing, I showed you how to find your social Influencers. In part two, I’ll now show you the top 3 methods to network and nurture your relationships with Influencers. Build klout by association. Nurture relationships with social Influencers. Network in person, too. It builds relationships - really! Networking with influential bloggers opens up worlds of opportunities. Developing relationships with social leaders can raise your own social credit, drive tons of hits to your blog, and hey, you could even learn a thing or two. Strike up a dialogue with Influencers through social networks. Social Influencers are, afterall, the most socially savvy in your industry. Sway them your way by connecting through the sites they love best. Twitter is a fast and effective way to connect with industry leaders, and develop ties with prominent bloggers. Use it regularly as a method to strengthen relationships - don’t just ‘cold call’ a DM and expect an immediate, positive response. Show your love: Retweet influencers, especially tweets to their own blog. Ask for their opinion: @mention a leader, and show you value their insights, by asking a question in their area of expertise. Mention when you’ve mentioned them: If you write about an influencer in your blog content, @mention them in a tweet - with a link to your blog. They’re more likely to share an article with their followers if they’re mentioned in it. Share their value: Tweet influencers’ blogs directly from their website, and @mention them with your own positive comments about their post. 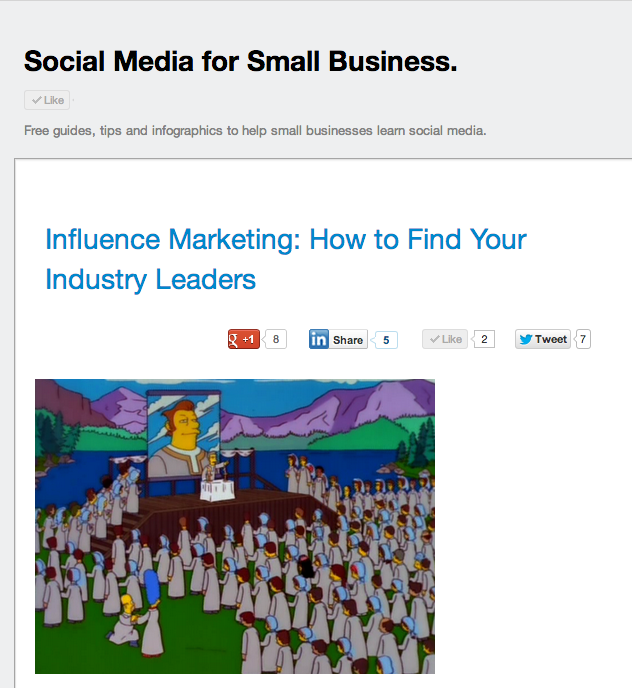 Share great articles posted on Influencers’ blog sites, and @mention in your Tweet. Use Facebook to get known by your Influencers, and your targeted consumers. Engage your industry leaders to enrich your ties, and participate in their community. Engage on their Page: Like, share and comment on influencer posts, particularly with updates linking to their own articles. Be part of the party: Comment on Influencer Facebook pages, and engage with other Fans by asking questions, and responding to other people’s comments. 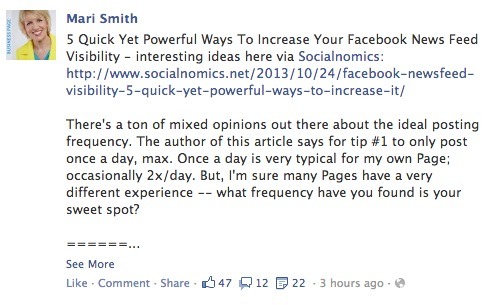 Stroke the ego: Share Influencers’ articles on your Facebook Page. Are you more advanced? : Make Facebook ads to create targeted personalized messages to reach prominent bloggers. Mari Smith is a powerful social Influencer. She often posts other Influencer articles and links on her Facebook Page. Google+ is where you’re going to find a lot of tech savvy social influencers. Use it well, and you’ll get known by your social leaders, and shared by a lot of middle influencers too. Join the club: Participate in industry related groups, and +1, share and comment on Influencer updates. Share the love: Share Influencer articles on your own G+ profile. When you do, +mention them in the update. Quote the best: Take quotes from prominent bloggers and use them as G+ updates. Share quotes in comments in their article updates, too. Be sure to source with an +mention. 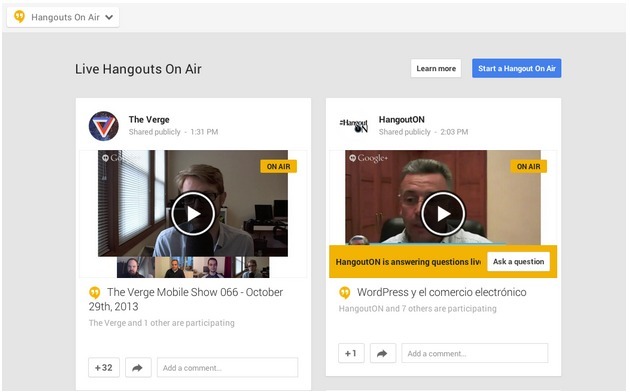 Hangout: Take part in Google+ hangouts hosted by social Influencers in your niche. When you’re a live participant, you’re one of 10 discussing a topic. You’ll develop relationships with others on the video. Participate in Hangouts on Air to connect with industry Influencers. LinkedIn provides you with massive opportunities to connect with top business Influencers (and customers). Use it strategically to get known by those in the know. Connect: Find your Influencers on LinkedIn. Send them a personalized message to request a connection. Endorse your Connections : Keep in touch with Influencers you’re already connected to. Endorse them to show you value their knowledge. Follow the money: If your Influencer has a business page, follow it. You’ll get their LinkedIn updates, on which you can then like, share and comment. 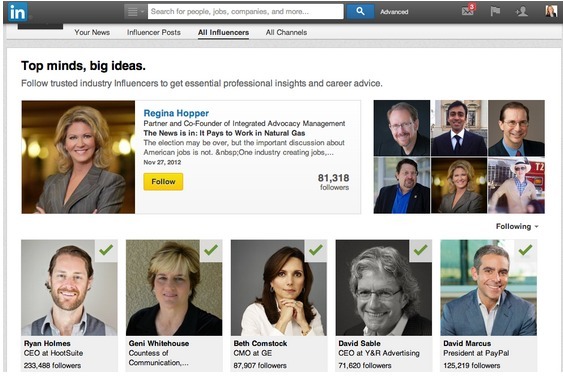 Get under the Influence: Use LinkedIn Influencers to find and follow your key industry Influencers. Comment on their updates to be seen by their followers. Ask questions and respond to other people in their community, too. Pinterest can be a highly influential site, resulting in tons of click-throughs (and purchases). Connect with your social Influencers on Pinterest, and engage to known by the real influencers: your consumers. Find and follow: Find your social Influencers, and follow them. Engage on their popular posts by repinning, liking and commenting. Share the love: Set up an article Board for your favourite Influencers. Pin blog articles directly from their site, to Pinterest. Get the latest lifestyle tips: Comment on Influencers’ pins with questions asking for lifestyle or problem solving tips. Engage with their community of followers too. Repin, repin, repin: Share pins from blog articles of industry Influencers. Repin them from middle influencers and others, too. When you repin an Influencers’ article, your pin Board can get seen by many. Meet with industry Influencers directly via in-person meetups, and online ones too. This concept may seem odd to some social media types, but meeting people in person does deepen relationships. Make the face-to-face opportunity: If you have the opportunity to go to social media conferences, blogging conferences, or other industry related forums - take it. Take the lead: Networking face-to-face instantly increases your level of relationship with bloggers and Influencers. Take the initiative to strike up conversations with attendees, speakers, and hosts of the conference. Keep in touch: Once you’ve met with an Influencer, keep in touch through your social sites. Send them an email, to follow up with any questions they had about your blog. Take it a step further : Host your own meetup, or get involved with your industry groups hosting face-to-face meetings and conferences. Volunteer, too - you’ll get to know the organizers and other middle Influencers. 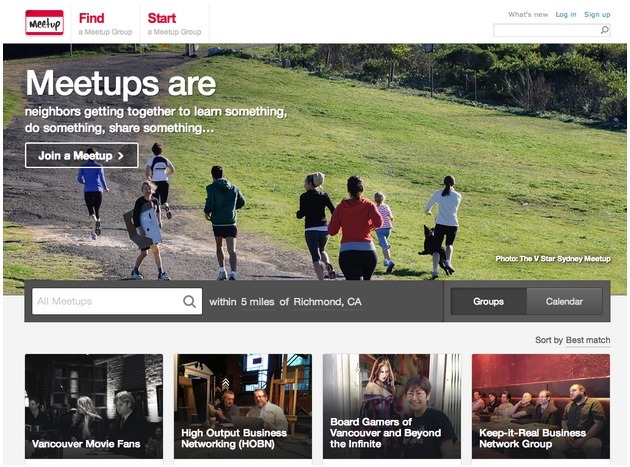 Find a meetup near you, and in your niche. Participate. The next best thing to travelling around to in-person conventions are online webinars, Hangouts, and conferences. Get connected to get connected: There are tons of live online events happening all the time. Find out about them through your Influencers, other social sources or by simply searching for them. Get involved: Register for live events that are relevant to your blog topics. Participate: Many live events have Twitter chats, or other methods to communicate and ask questions of the speaker (s). Take the opportunity to get better connected to your Influencers - and your participating market of middle Influencers. Take it a step further: Take this a step further and host your own webinar, or partner to present your own talk at an online conference. 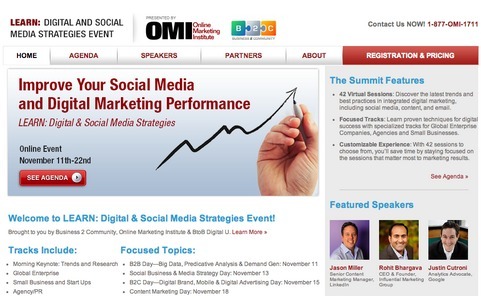 Take part in web based conferences, such as the “Improve your social media and digital marketing performance” event hosted by the Online Marketing Institute and Business2Community. To influence your blogging Influencers, talk to them where they live. Connect via their websites, and engage on their blogs. Your Influencers are at the top of your industry. They are the most connected socially, and have incredible sway with your consumers. Learn from them! Subscribe: Subscribe to your Influence leaders’ blog RSS feed. Learn: Learn about your industry, blogging, and your Influencers’ business by reading what they have to say, how often they post, and what opportunities they can provide you. Share: Share Influencer blog articles to your followers, friends and fans. Connect: Once you’ve subscribed to a blog, your Influencer will likely stay in touch with upcoming networking opportunities. Take the opportunity to further get to know your Influencer, by asking to become more involved, or asking for a share of your blog article(s). 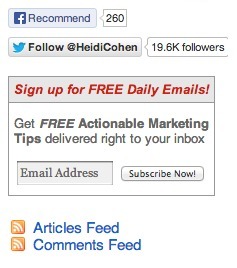 Sign up for Influencers’ (such as social media leader Heidi Cohen) blogs to learn and connect. Commenting on Influencer blogs is a great method to engage with your market, and keep connected with prominent bloggers in your industry. Note: There are good ways to comment, and bad ways to comment. Don’t engage in grey hat practices such as spamming ‘do-follow’ sites to get backlinks and increased SEO. You may get banned from the bloggers’ site - and Google won’t like you either. Show your stuff: Comment with intelligence to show your interest in the Influencer’s blog, and that you know what you’re talking about. Show your face: Get a gravatar, or sign in to sites with Facebook or Twitter (or other social sites). Letting people see who you are goes a long way to build trust and give your comments more merit. Engage with the community: Respond to responses on your comments and like other people’s comments. 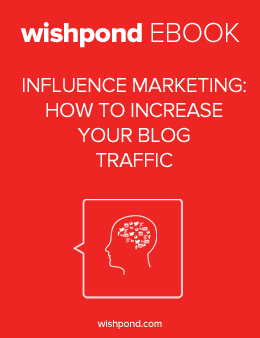 Your Influencers’ blog readers are your readers are too. The better you engage, the more traffic you’ll generate to your website. Linking: Link to your blog articles that are relevant and adds real value to the dialogue. Most top blogs are highly moderated, and will delete clear link building comments. Do not spam your Influencers’ blogs! It’s bad for you and your business. Ultimately, what you write on your own blog is the make or break for readership, and whether Influencers will share your words. Use it well. Consistent: Publish blog articles regularly. This not only helps with your SEO, it shows your industry Influencers that you know your stuff. They’re more likely to share what you’ve written - and your customers will also see you as an industry leader. Engaging: Use interactive tactics on your blog. You could host contests and sweepstakes, for example (ok, I’m totally biased, as Wishpond makes contest apps and other online marketing tools). Do make sure your article topics are relevant and interesting to your markets. End your blog articles with questions, to ask your readers for their opinion and further tips on your topic. Write good quality blog content, that your customers wants to read. Networking with industry Influencers has long been a successful marketing strategy. Do it well and you’ll develop more social sway for you and your business. You’ll increase your SEO by increasing influential social shares. And ultimately, you’ll drive more traffic to your website. I’ll discuss how to engage through guest blogging in part 3 of my 3 part Influence Marketing series. What do you think? Do you use Influence Marketing? How do you engage your social Influencers to connect and share your content? What tips do you have?